Broccoli and cheese are an unbeatable combination. Comforting and so satisfying. Dig in to a hearty meal! 1. If you have a cast iron dutch oven (4 quart or more), this works great, if not use a stock pot. Cut bacon into small pieces and cook in dutch oven to render the yummy bacon grease. I cooked mine until crisp, then remove the bacon (but leave grease in pan) and set aside to drain. 2. Over medium heat add chopped onion and bell pepper to the bacon grease. Stir the onion and bell pepper around and let it cook until the onions are translucent. 3. Add broth, salt, cayenne pepper, and parsley. Bring to a simmer. Meanwhile, steam your frozen broccoli. Then fine chop about half of it. 4. 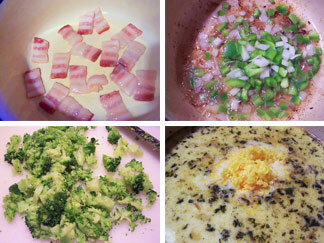 Add broccoli to soup and reduce heat to low. 5. Add heavy cream and water and cheese. Do not boil. Stir over low heat just until cheese melts. 6. Ladle into bowls and top with the crumbled bacon that you set aside earlier.